Hoyo Hoyo Safari Lodge - Skukuza Accommodation. A celebration of the local Tsonga culture, from its traditional rondawel rooms to the splashes of tribal design and earthy tones defining its interiors, Hoyo Hoyo exudes a hearty spirit of warmth and welcoming. Expect an authentic encounter with the local Tsonga culture in extraordinary bush surroundings; the Kruger National Park, one of Africa’s most renowned conservation areas and home to the Big Five. Join the Cape-Turtle Doves and Arrow-Marked Babblers as they welcome a new day, heading out in to the bush for a feast of the senses; the smell of damp grasses, the pinks, oranges and yellows of a gorgeous African sunrise, the hissing of hundreds of crickets preparing for a warm bush day. Spend your afternoon lazing at the infinity pool, watching the Monarch butterflies flit past and the geckos scurrying across the deck, or retreat to the comfortable lounge for a quiet read surrounded by traditional Tsonga craft and the light breeze of a lazy afternoon. Savour a tasty Tsonga feast, treat yourself to a lengthy afternoon siesta or indulge in a soothing massage to revive body and mind. Let the rhythm of the Shangaan ease and entertain you, inspire and teach you. Sit on the deck surrounding the open-air fire and stare at the brilliant starry sky as you listen to a storyteller tell tales of local myths and legends. Get up close and personal with local traditions, a special encounter with the Kruger National Park and first-class hospitality at Hoyo Hoyo Safari Lodge, guaranteeing a memorable African bush experience. Guests are accommodated in six circular Tsonga homesteads with traditional earth-coloured walls and tapered thatched reed roofs. Tsonga tradition runs throughout these comfortable homesteads; the warm glow of brightly coloured walls, traditional ornaments and little embellishments on lamps, door handles and mirrors bringing this local culture to life. All 6 traditional African suites are air-conditioned and have en-suite bathrooms with antique baths and outside shower. Relax on your private deck looking out on to the bush, take a long, leisurely shower in the open air or melt in to your comfortable king-size bed for an afternoon siesta. 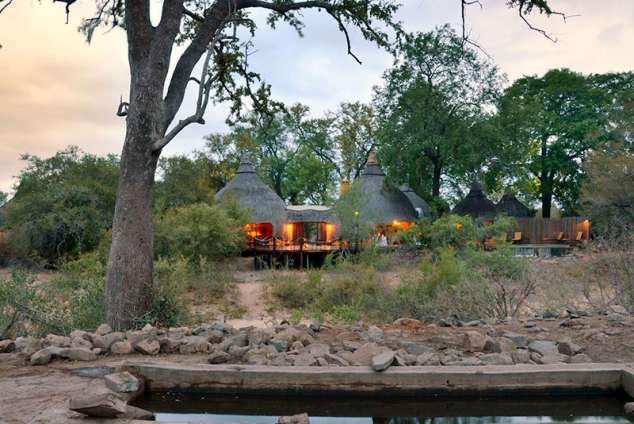 It’s your relaxing, informal bush experience on your terms. Children 12 years and older are welcome and are accommodated in their own rooms. Hoyo Hoyo Safari Lodge offers indulgent spa treatments and a soothing massage in the seclusion of your private deck with the scents of ylang ylang, vanilla and cedarwood soothing body, mind and soul. There is no Wi-Fi or cellphone signal at this exclusive and remote safari lodge, allowing complete relaxation for our guests. The sparkling swimming pool promises a refreshing dip while providing the opportunity to enjoy the rich and varied wildlife that comes to the river for a cooling drink. Our guides are more than happy to share their unrivalled knowledge of our feathered friends with our guests. There is so much to learn about birds on our concession. From the fierce marshall eagle to the smallest and most delicate blue waxbill. Enjoy the wonders of Kruger from the comfort of your personal vehicle or rental car. Stop off at one of the many picnic sites for an ice cream or an ice cold drink during summer time. Join us for a lovely dinner under the African Skies, in an unfenced area of our private concession in the Kruger National Park. This is a privilege that is reserved for our guests only. Nowhere else in Kruger will you be able to dine with the Big Five. Your rewards for a hard day’s safari are the delicious dishes created by Hoyo Hoyo Safari Lodge’s talented chef. Homemade baked goods, light salads and local specialties such as beetroot salad and ostrich steak are served in relaxed surroundings; the sounds of the bush providing all the accompaniment you need for a memorable dining experience. Enjoy a hearty buffet breakfast with a variety of fruits, nuts, yoghurts, breads, pastries and cheese or opt for a full English breakfast with bacon, sausage and eggs; freshly squeezed orange juice and strong coffee at the ready after your morning game drive. Lunch is a light, informal affair with a buffet laden with tasty salads and meats. Followed not long after by High Tea with tea or coffee to wash down a delicious selection of cakes and pastries baked freshly at the lodge. After a rewarding evening’s safari, warm yourself around Hoyo Hoyo’s open-air fire and enjoy a magical three-course dinner under the stars. Good wine and good conversation flow while you listen to the enchanting sounds of the surrounding bush coming alive at night. Welcome drinks on arrival, butler service. The water is safe to drink, while bottled water is placed in your room courtesy of Hoyo Hoyo Safari Lodge. Spa treatments available in the privacy of your room at an additional charge. Safaris in 4 x 4 vehicles, bird watching, self-drive in the Kruger National Park, guided safari walks by prior arrangement. The camp is situated in a Malaria area. Gate entry fees are applicable and are charged per person per stay. All guests must enter at Orpen Gate a minimum of 1.5 Hours and Paul Kruger Gate 3 hours before gate closure. PLEASE NOTE: If guests are not in time at the respective gates, they will not be permitted to enter the park and they will have to find alternative accommodation for that night. booked at time of reservation, at an additional charge. approximately an hour and a half. This transfer is charged at R40 per vehicle and R30 per person. reservation, at an additional charge. Hoedspruit or Kruger Mpumalanga International Airport. connecting flight from Hoedspruit or Kruger Mpumalanga International Airport. arrival of your connecting flight from Hoedspruit or Kruger Mpumalanga International Airport. After entering the Orpen Gate travel for 22km on the H7. Turn right on the S36 where you will see the signpost marked Imbali, Hamiltons, Hoyo Hoyo with the exact distances. Drive for 3.5km where you will reach a T-junction. Turn right to Hoyo Hoyo Safari Lodge. 607 page views since 16 Mar, 2018. Last updated on 21 May, 2018.